You asked, we listened. This site is designed to help you become a more active advocate for CIDA. 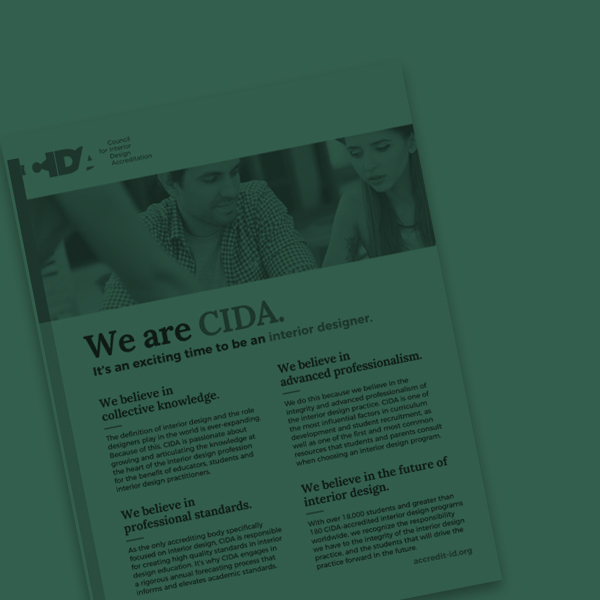 Below you will find links to download the latest CIDA-branded materials. Active advocates help us strengthen our brand relevance for the advancement of the interior design profession. Begin by using the tools above to communicate the value and impact of our organization, and see additional tips below for other ways to engage with CIDA. CIDA is passionate about the knowledge at the heart of the interior design profession and about growing and deepening that base of knowledge. Check out our latest Summit Report to learn more. LinkedIn , Facebook and Twitter. 3. Share our posts to your news feed.